Okay guys, I have found another use for mason jars. You know how much I love them, right? (check out here, here, and here, if you’re not convinced). 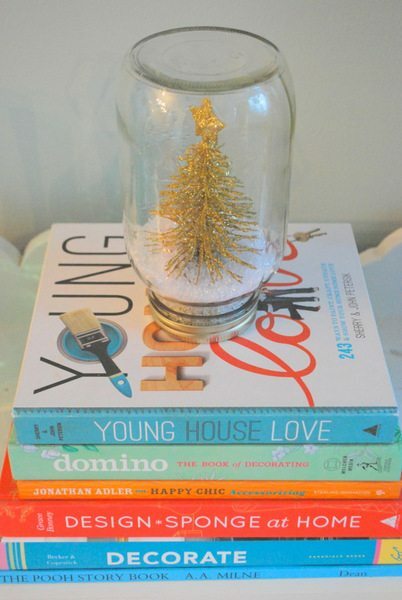 I saw some mason jar snow globes floating around on Pinterest and was totally swooning. 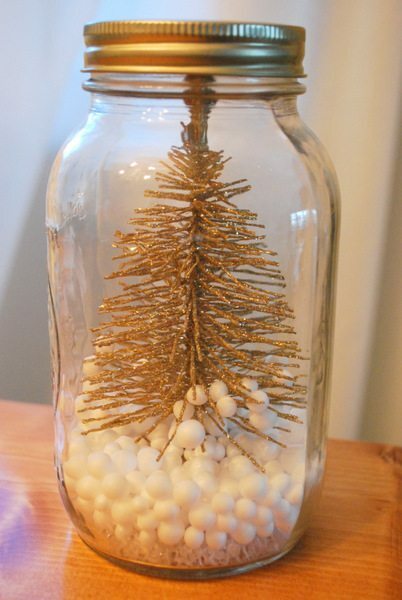 Love of mason jars + love of christmas + love of all things crafty = a lot of love. So I thought I would try my hand at these bad boys to amp up the festiveness around here. I decided to take the easy route and nix the real snow-globe with water and all that jazz (I did see tutorials out there for those though), and just decided to do little winter scenes. 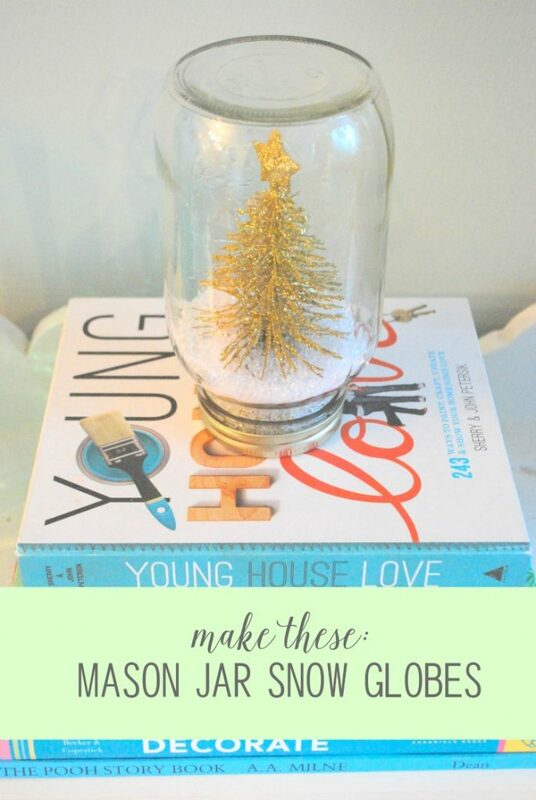 Here are my easy DIY mason jar snow globes. First step was to do a trip to the dollar store for supplies. 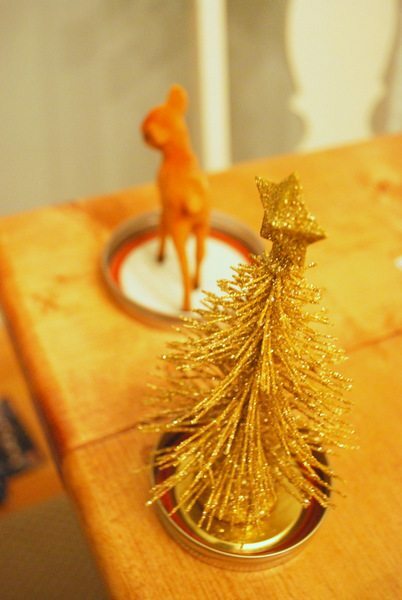 I grabbed some gold mini christmas trees, two different white ‘fillers’ (beads and styrofoam balls), and then some little animals. I wasn’t really sure if the animals would fit, but grabbed them just in case. 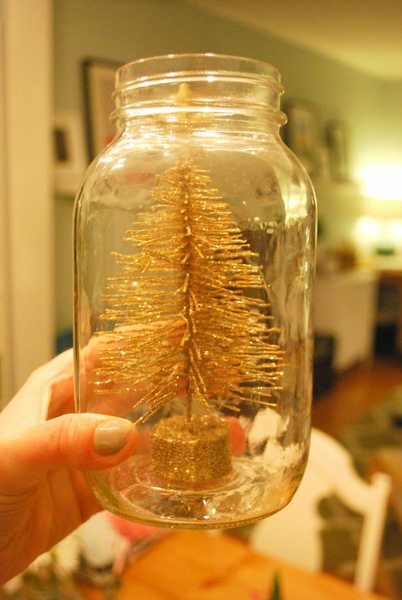 After I had a chance to test everything out, the only things that fit into my mason jars were the christmas trees and the small Bambi. The polar bears and other guys are going to have to be just decorative (unless I find some gigantic mason jars!). 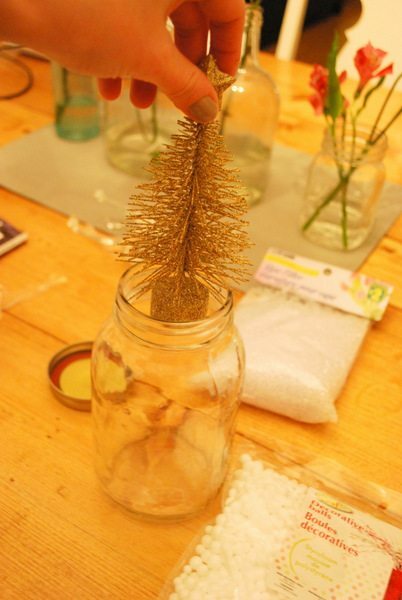 … and then placed it in the mason jar, right way up. 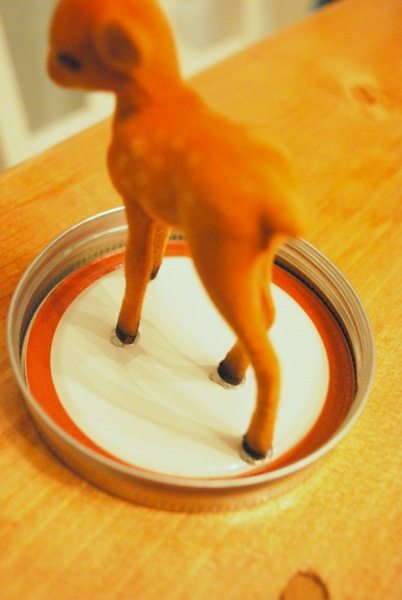 My second approach was to hot glue the item onto the bottom of the mason jar lid. 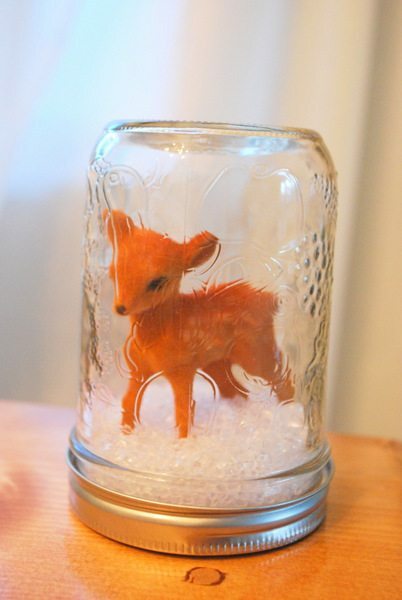 This way the jar would be sitting on its top and be more snow globe-y. Before screwing the lids back on, I poured in some of the vase filler (either the beads or the balls – doesn’t matter which you use) as the snow. And here is how they ended up! Aren’t they sweet? I think I like the ones that sit wrong side up as they seem more like true snow globes and are easier to see into. I’m totally loving this project. It took all of 15 minutes, cost less than $10 for all 3 (and I have leftover supplies), and adds a little injection of holiday sparkle (in a not-too-over-the-top kind of way). Have you guys started your holiday decorating yet? Done any fun festive projects? 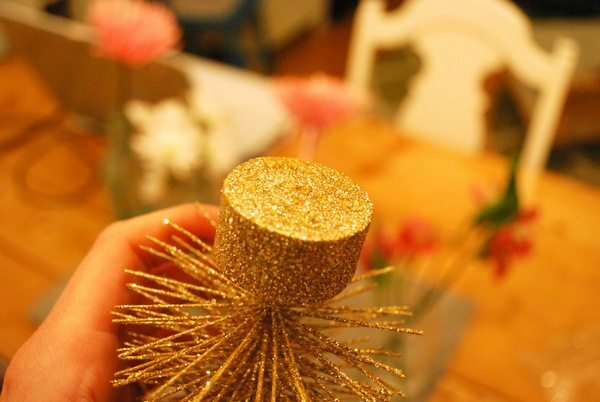 Do you tend to use the same decorations every year, or switch it up? Got a theme going for this year? Oooh, I love the way that looks on a stack of books- so cute!! 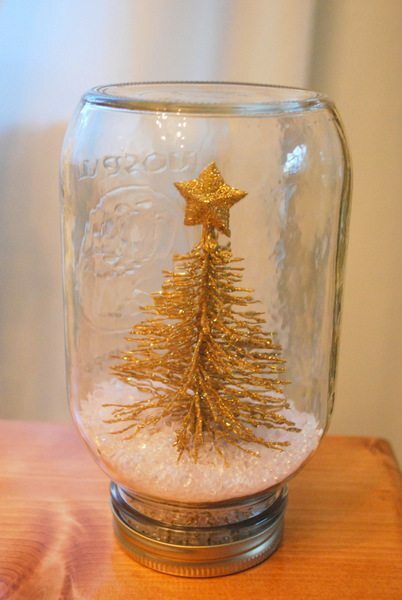 I like how the gold tree plays off the gold band of the mason jar lid- I didn’t anticipate the matching but I love how that looks. I picked up a couple of the vintage ball jars with the old zinc bands & glass top from Goodwill and use them for Halloween- one for a crow and one for a spider ‘specimen”. I think I need to pull them out of the halloween stash and replace them with christmas type fare. Those would look so good! Love that you used them for halloween too :) Have fun! These are so cute Gemma! Great idea! I love this DIY! 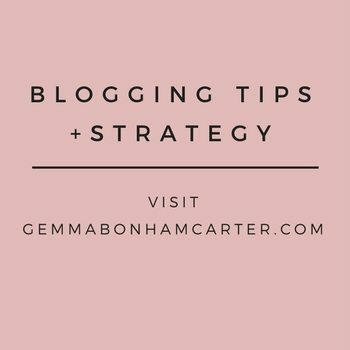 Really helpful this season! So funny! 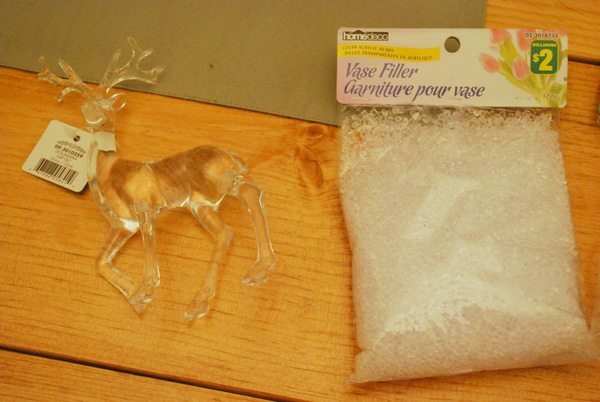 I bought the exact same clear acrylic deer from Dollarama! 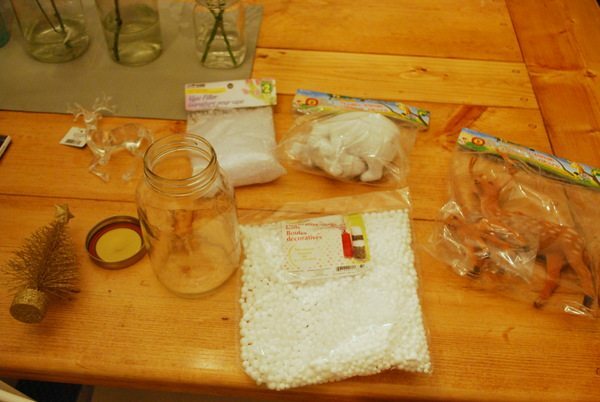 I plan on getting crafy and making my “snow globes” tomorrow. GOtta love pinterest for the inspiration! These are really cute! Love the little deer. This is precious. 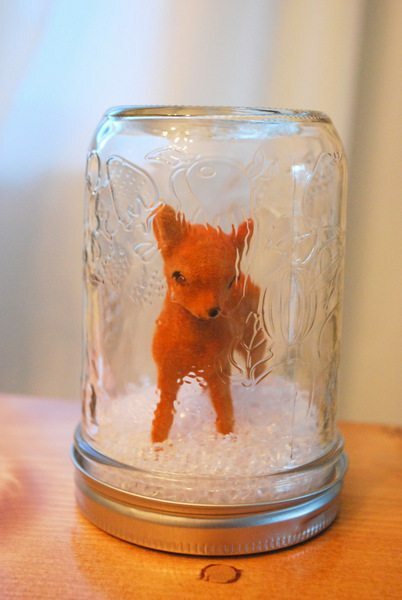 Sometimes snow globes can lean more towards tacky but this is perfection! Thanks for joining the Dare to DIY! 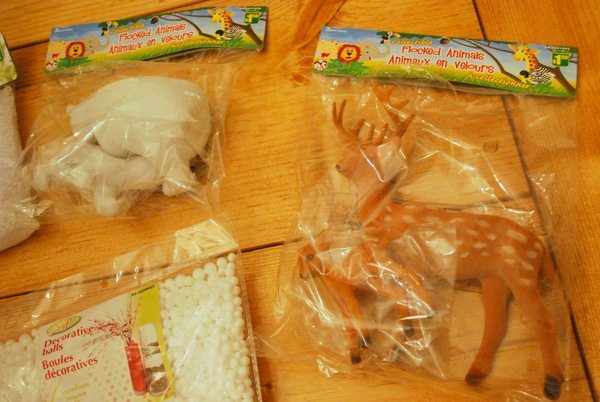 I’ve been to the dollar store and didn’t see these nice animals. I did get a very glittery reindeer. Had fun with that. Thanks for showing how you made these. Linda Happy Christmastime. 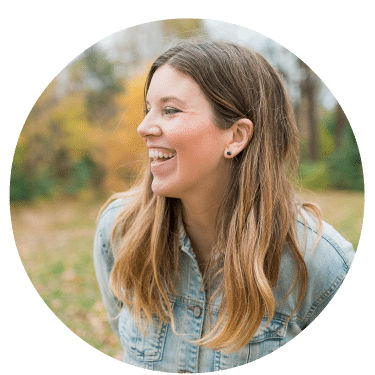 Shoot – I went to a pretty big Dollarama, so maybe it had more inventory? Glad you found a glittery reindeer!